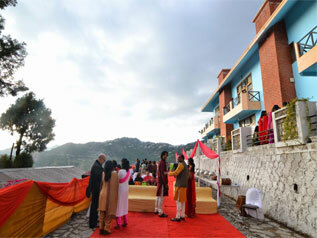 Wedding at Resort is Green Breeze's newest boutique fully featured conference venue. Situated only 15 minutes from the Tulip Inn Green Castle Hotel & Spa it the perfect venue for one day seminars, product launches to corporate conferences if the Delagates want to combine usage of both hotels. Our full Resort facility gives Conference Organisers the ability to ultilise the whole property. Conference organisers are welcome to incorporate some of our unique resources, such as buses and boats. 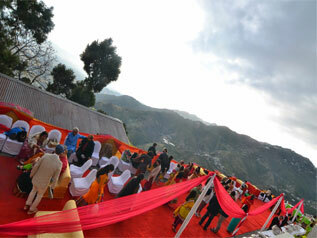 They really help to create that special and memorable event in Green Breeze. The Resort's "Kia Ora" conference room features modern conference facilities capable of seating up to 400 people. The room can be configured to a variety of seating arrangements to suit your requirements. Our conference room boasts a full range of audio visual equipment as well as the ability to connect directly to the Internet. Our experienced Tulip Inn Green N Breeze Resorts Mussoorie Conference and Corporate team of staff lead by Rakesh Sharma will work with you to ensure your delegates enjoy a successful and memorable event. Our Green N Breeze conference facilities include indoor and outdoor break-out or entertainment areas, restroom amenities and full on-site catering. Our Executive Chef, Mr Ganesh Bhatt and his team specialise in providing Uttranchal taste sensations using the unique herbs and spices of the land. As a full facility spa resort the Tulip Inn Green N Breeze Resorts Mussoorie conference and associated facilities provides the ideal venue for spa retreats and a venue for conference partner programmes. Delegates can enjoy the full range of Spa facilities including Whirlpool and Massage in our unique in house Spa. Please contact us for group accommodation rates.